SAORI is a free style of hand-weaving which was founded in 1968 by Misao Jo who was born in Osaka, Japan. In the Saori philosophy, everyone can freely express themselves regardless of age, gender, disability or intellectual aptitude. In Japan there are more than 30,000 SAORI weavers. Everyone can enjoy weaving using their own creativity. SAORI believes there are no mistakes; every weave has its own special character. Humans are not machines. We do not have to imitate the product of machine. Humans can weave for the sake of weaving without a pattern or perfection. On the contrary, imperfections can be facinating and attractive. 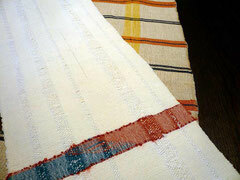 SAORI weaving has a human quality; full of imperfections, the mistakes are accepted. An old adage claims that success is built on failure or mistakes but we at SAORI say, "Mistakes themselves are flawless." How did SAORI weaving start? SAORI was founded in 1968 by Misao Jo who was born in Sakai city, Osaka Japan in 1913. She was dissatisfied with the current limitations and rules that were applied to weaving at the time. She developed a new style of loom which is based on an older, traditional style. She also developed a new approach to weaving: one without rules and restrictions. The main philosophy is freedom, a true freedom of expression. A release of individuality. Using color and imagination, texture and widths, one weaves like an artist drawing a picture or a penning a poem. 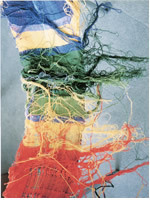 Loose threads along the edge and accidental skipping of threads add to overall beauty in the same way as freedom of SAORI. Misao Jo received the honor prize of the prime minister of Japan and another awards from Ministry of welfare.